This was a lady whom we saw in Seoul Namdaemun Market, South Korea. Do you know what was she doing in the street? From the ribbon she wore, I knew she was a preacher. 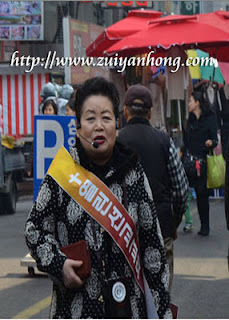 She was preaching to the Namdaemun Market visitors by using a microphone. We also met some Koreans circulate religious flyers in Myeongdong. It seems that street preaching is quite common in Seoul, South Korea. Yes, you are right. They are so devoted. Merry Christmas.